For more information on the psychotronic/directed energy torture part of THE SYSTEM, visit http://www.exoticwarfare.org/, or you can Google these terms: “Ionatron, PEP, or PIKL.” I am not accusing Ionatron or any other contractor of torturing Americans or other citizens on this planet, but reading up on those terms and visting ExoticWarfare will make you realize that long-distance, pulse plasma weapons do exist and can be used to transmit other energies - microwave, radio, ELF, etc. The plasma beam is used much like an electric line to the targeted person. Article free to post anywhere. The above graphic is based on “Hit ‘Em Where It Hurts,” Air Force 2025. You might want to be familiar with “Weather As a Force Multiplier: Owning the Weather in 2025,” a chapter from the future forecast, Air Force 2025 (http://csat.au.af.mil/2025/index.htm) (1) People concerned about the ongoing, worldwide, aerosol operations in the atmosphere termed chemtrails (2) often point to this chapter as evidence that the U.S. Air Force may be involved in global, spray operations for weather control. Writers – Izakovic Rolando,(3) Amy Worthington,(4) and Scott Gilbert(5) have explored the evidence in detail. While it is obvious that our weather is being manipulated by these aerosol operations and other atmospheric, military applications are afoot, weather control, while a very bad idea, might be minor compared to what I am going to discuss. And, the concept that the spraying is a way to slow down global warming seems like a big-old, cover story. Lydia Mancini(6) has explored some of the mind-altering aspects of the chemtrails, but I think I have found one of the final pieces of the chemtrail puzzle – the Air Force studied how to put sensors that are nano-scale into a population’s food supply, water, and air through aerial spraying so that they could get those sensors into people’s bodies. Read on to catch on to all the connections. “thinner than a human hair” sensors . . . sound like chemtrails? Recently, Dr. Hildegarde Staninger,(10) an industrial toxicologist, and Dr. Mike Castle,(11) a polyethylene expert and chemtrail activist, put their heads together to determine whether the nano fibers growing out of the skin of people who have the fiber disease, Morgellons, and the nano fibers from chemtrails have any relationship to each other. People with Morgellons have different colors of nano fibers growing out of non-healing sores on their bodies. Chemtrail fallout has similar, many-colored fibers that look very much like the Morgellons fibers. These fibers are on you and in your home. You can find them with a fluorescent, black light. Ultraviolet light makes them glow. Use a magnifying glass, too. A communicable (nanotechnology triggered?) invasion of human tissues in the form of self-assembling, self-replicating visible tubes, colored fibers, wires, arrays with what seem to be sensors or ‘antennae’, and other visible configurations, some carrying what may be genetically-altered and spliced DNA/RNA. These (nano-triggered) ‘machines’ thrive in alkaline ph conditions and use the body’s bio-electric energy, its minerals and other unidentified elements for power. Dr. Staninger thinks that these nano particles may be able to self-assemble into full-grown nanowires once they are in the brain or other organs. (18) She says we eat this nanotechnology; it is in our food – the plants and animals. She says it copies the DNA of germs or certain other cells that it is in contact with on the inside of our bodies. It makes more germs, more cancers. One kind of nanowire is implicated in the creation of pseudo-hair and pseudo-skin. One woman with Morgellons has tested positive for the pseudo-hair. These self-replicating proteins even create chimeric forms that look a lot like insects or parasites. Babies are being born with these nano machines in them. This is proof that this nanotechnology can pass through the protective barriers in the body. Clifford Carnicom is a man with a background in science: geodetics, math, computer science, and physical science. He worked for 15 year with various agencies — DOD, Forest Service, and The Bureau of Land Management. He studies what many believe to be the chemtrail-induced, rising alkalinity of our planet. He documents the increasing amounts of calcium, magnesium, barium, and potassium in our rainwater. (20) Interestingly, J. Walleczck at the Lawerence Berkeley Laboratory researched in 1991 how calcium ions help to transport electricity across the cell membranes at the molecular level. (21) So, mucking around with the natural, mineral balance and electrical properties of the earth and our bodies is not a good thing. Carnicom also documents the high levels of salts in our soils due to reactive metal salts from the chemtrails. He says it is these salts that are making the earth more conductive. (22) These chemtrail substances are easily ionized by ultraviolet light and are causing the air to have high levels of positive ions. This is unhealthy for all living beings. He is finding the same blood abnormalities among people with Morgellons and those who do not show any signs of Morgellons. It would stand to reason that if the earth is being altered to become more conductive and alkaline then we, ourselves, are becoming more conductive and alkaline. The earth and all residents are now a favorable home for this alkaline-loving nanotech which can just keep on using up our bio-electricity to self-replicate and self-generate sensors, antennae arrays, and other mystery, nano machines inside of our bodies. An LOV stands for “Locus of Values.” An LOV can be a hard target: something physical, or an LOV can be a soft target. 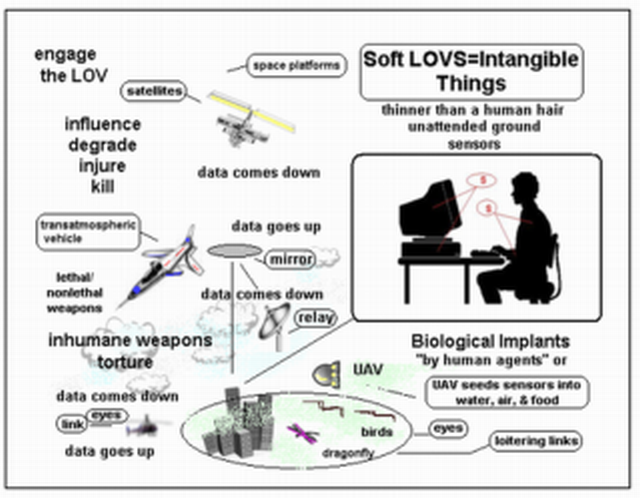 “The LOV is that which an adversary holds dear . . . . Soft LOVs are intangible things: Systems, knowledge, or ways of thinking.”(26) A UAV is a unmanned aerial vehicle. In the document, all the sensors are called “unattended ground sensors,” even the bio–implants. In one of the graphics, arrows very blatantly point to unattended ground sensors that are located in the crotch areas of a couple of men. (27) In another graphic, the arrows point to sensors in a man’s shoulder and his wrist. When I read this, my mind flashed on Denzel Washington digging a microchip out of his shoulder in the movie, The Manchurian Candidate. Besides the bio-implants, The Air Force study discusses dropping “grain-sized” sensors from the air to form a surveillance network on the ground, and microsensors can be surreptiously put into homes or appliances. It is now five years later and the sensors in a network like this are about the size of a deck of playing cards. Sensors that are not classified, that is. How could the Air Force “Hit ‘Em Where It Hurts”? As a more economical model, space mirrors can be used to bounce data from UAVs to ground stations. (51) A plasma mirror can also be created by a microwave heater beam station that heats the atmosphere, and this plasma area can be used just like a mirror. A Dr. Eastlund pioneered this technology. His work with the HAARP ionospheric heater was sponsored by ARCO, a major aluminum producer which is owned by British Petroleum. (52) Oddly, chemtrails have a lot of aluminum particulates. There is a saying: life mirrors art. Let’s go back to the original chapter we discussed. If the aerosol operations described in “Weather As a Force Multiplier” are just sci-fi, military daydreaming, then why are there charts within that document than can only be described as spray schedules? These charts tell the reader exactly which substances will be sprayed and during which years. A weapon like this can be used for covert war and the micro-management of a population. A non-lethal weapon trained upon a person all the time becomes a lethal weapon. But, we can trust men who think it is no big deal to sneak electromagnetic implants into other people’s privates, right? The lack of respect for inalienable rights that is displayed by the Air Force officers who wrote this report is shocking. Hitler would have wet dreams about this death-squad technology. Weapons like these will always be abused by someone. That is why the weapons should not even exist. Someone will say: ”Well, it is only to be used against The Enemy.” How do you spray only one house? How do you spray only one air supply? Shouldn’t there be some kind of ban on turning people into Borgs? It is against treaties for the military to alter the environment. Some Air Force guys happen to think that putting sensors into non-combatants and enemies alike via their food, water, and air is just dandy. Coincidentally, that scenario sure sounds like the chemtrail/Morgellons nanotechnology epidemic ripping through American bodies right now. I am just not sure I want to give the Air Force my love. 1. “Weather As A Force Multiplier: Owning the Weather in 2025,” a future study conducted 1995 – 1996 for the Air Force Chief of Staff, a research paper by Col Tamzy J. House, Lt Col James B. Near, Jr., LTC William B. Shields (USA), Maj Ronald J. Celentano, Maj David M. Husband, Maj Ann E. Mercer, and Maj James E. Pugh, August 1996, Air Force 2025, website, chapter 15. 2. “Aerosol Crimes & Cover Up,” by Clifford E. Carnicom, carnicom.com, website, numerous pages, 1999 – 2008. 3. “Report Of Chemtrail Spraying Frenzy In Croatia,” from Izakovic Rolando, June 5, 2000, rense.com, website, 1997 – 2008. 4. “Chemtrails and Terror in the Age of Nuclear War,” by Amy Worthington, May 2004, “Idaho Observer,” website, 1997 – 2008. 5. “Environmental Warfare and US Foreign Policy: The Ultimate Weapon of Mass Destruction,” by Scott Gilbert, September 23, 2004, author archives, Global Research, website, 2001 – 2008. 6. Bariumblues, by Lydia Mancini, bariumblues.com, website, numerous pages, 2003 – 2008. 7. “Chemtrails:GAO report admits “chaff” – Lab report reveals much more,” July 2006, “Idaho Observer,” website, 1997 – 2008. 8. “ERYTHROCYTES: POSITIVE VISUAL IDENTIFICATION,” by Clifford Carnicom, carnicom.com, website, 1999 – 2008. 9. STRANGE DAYS STRANGE SKIES – YOU ARE NOW BREATHING ETHYLENE DIBROMIDE, NANO-PARTICULATES OF ALUMINUM AND BARIUM AND CATIONIC POLYMER FIBERS WITH UNIDENTIFIED BIOACTIVE MATERIA, by Glenn Boyle, strangedaysstrangeskies, web album, a large collection of photos, lab reports, and documentation that is a work in progress. 10. “Dr. Hildegarde Staninger, Ph.D., RIET-1, Industrial Toxicologist/IH and Doctor of Integrative Medicine, Bio,” September 17, 2007, rense.com, website, 1997 – 2008. 11. “Dr. R. Michael Castle, Bio,” May 7, 2007, rense.com, website, 1997 – 2008. 12. “Project FMM: Fibers, Meteorite & Morgellons,” by Project FMM Research Team, March 29, 2007, rense.com, website, 1997 – 2008. 13. “Rense Special Morgellons Broadcasts,” No. 7, March 29, 2007 & No. 11, no date, mp3 audio files, June 22, 2006 – ongoing, rense.com, website, 1997 – 2008. 14. “Texas Chemtrail Samples Compared To Samples From Venice Italy,” by Dr. Hildegarde Staninger RIET-1, November, 27, 2007, rense.com, website, 1997 – 2008. 15. “Morgellons Defined,” December 5, 2007, rense.com, website, 1997 – 2008. 16. “Rense Special Morgellons Broadcasts,” No. 7 & No. 11. 17. “Nanoparticles in the Brain,” by Jim Giles, January 5, 2004, Nature.com, website, News@Nature section, Nature Publishing Group, 2008. 18. “Rense Special Morgellons Broadcasts,” No. 7 & No. 11. 19. “Rense Special Morgellons Broadcasts,” No. 7 and No. 11. 20. “Calcium & Potassium,” by Clifford Carnicom, March 15, 2005, carnicom.com, website, 1999 – 2008. 21. “Electromagnetic Field Effects on Cells of the Immune System: The Role of Calcium Signalling,” by J. Walleczck, Research Medicine and Radiation Biophysics Division, Lawrence Berkeley Laboratory, University of California, Berkeley, California 94720, “The FASEB Journal,” Vol 6, 3177-3185, The Federation of American Societies for Experimental Biology, 1992, fasebj.org, website, 1992. 22. “Salts of Our Soils,” by Clifford Carnicom, May 11, 2005, carnicom.com, website, 1999 – 2008. 23. “Hit ’Em Where It Hurts: Strategic Attack in 2025,” a future study conducted 1995 – 1996 for the Air Force Chief of Staff, a research paper by Lt Col Jeffrey E. Thieret, Maj Steven J. DePalmer, Maj Frederick I. Guendel, Jr., and Maj Michael A. Silver, August 1996, Air Force 2025, website, chapter 6, pgs. 8 and 20. 28. “Tech Wave 2: The Sensor Revolution: Soon, sensor networks will track everything from weather to inventory,” The Future of Tech – Roadmap, “Businessweek Magazine,” August 25, 2003, businessweek.com, website, The McGraw-Hill Companies, Inc., 2000-2008. 29. “SMART DUST – TARGETED SMART DUST HOW IT WORKS,” Sailor Research Group, Department of Chemistry, University of California, San Diego, chem-faculty.ucsd.edu/sailor, website, February 27, 2003. 30. “Chemtrails Over America: A Special Report,” by Mike Blair and other researchers, June 21, 2001, Wisequakker, website, home1.gte.net/quakker, last update: July 4, 2003. 31. “Hit ’Em Where It Hurts,” pg. 23. 32. “Researchers Create DNA-Based Sensors for Nano-Tongues and Nano-Noses,” Physorg.com, website, September 15, 2005. 33. “Hit ’Em Where It Hurts,” pg. 22. 34. “Biometric Person Authentication: Odor,” by Zhanna Korotkaya, Department of Information Technology, Laboratory of Applied Mathematics, Lappeenranta University of Technology. 35. “Hit ’Em Where It Hurts,” pg. 22. 39. “Global 3-D Wifi SpySat Project Provokes NRO Crisis,” Washington, D.C., January 1, 2007, rense.com, website, 1997 – 2008, further information available at: billgrisham.us. 40. “Dragonfly or Insect Spy? Scientists at Work on Robobugs,” by Rick Weiss, Washington Post Staff Writer, Tuesday, October 9, 2007; Page A03,”The Washington Post,” Washington Post.com, website, 1996 – 2008. 41. “Morphing-wing robotic birds to spy on us,” by Roland Piquepaille, Emerging Technology Trends, blog, July 24, 2007, ZDNet: Where Technology Means Business, zdnet.com, website, CNET Networks, Inc., 2008. 42. TAG: Tactical Aerospace Group, website, International Marketing Office, 468 North Camden Drive, Beverly Hills, CA 90210, copyright: Tactical Aerospace Group Corozal, Belize, C.A., 1981 - 2008. 43. “Unmanned Aerial Vehicles,” by Greg Goebel: In the Public Domain, v1.4.1, TOC (19 chapters), vectorsite.net, website, March 1, 2008. 44. “They make no sound,” handpen.com, website, no date. 45. “US military plans for new UAV to stay airborne for 5 years,” by Graham Warwick, “Flight Global Newsletter,” flightglobal.com, website, May 25, 2007, Reed Business Information, 2008. 46. “Solar Powered UAV,” by Jim, “The Energy Blog: The Energy Revolution has begun and will change your lifestyle,” thefraserdomain.typepad.com, blog, March 23, 2006. 48. “Air Force developing UAVs that can recharge on power lines,” posted by Nilay Patel, “Engadget,” web magazine, Dec 14th 2007 4:34PM, Engadget and Weblogs, Inc. Network, 2004 – 2008. 49. Aerospace Operations in Urban Environments, by Alan Vick,, “Appendix B: Microwave Recharging of Mini-UAVs and Micro-UAVs,” Rand Corporation, 2008. 50. “Holographic Cloaking Stealth Technology,” by Luke, orbwar.com, website, 2006. 51. “Hit ’Em Where It Hurts,” pg. 28. 53. “Hit ’Em Where It Hurts,” Chapter 3, pg. 12 – 18. 55. pg. 24 – 26. 57. pg. 36 – 37. 58. pg. 23 – 24. 60. “What Chemtrails Really Are – The Short Scoop,” by Carolyn Williams Palit, a work in progress, 2005, xiandos.info, website, Republic of Seychelles, 2006. 62. “Nanogenerator Fueled by Vibrations: An array of zinc-oxide nanowires that generates current when vibrated with ultrasonic waves could provide a new way to power biological sensors and nanodevices,” by Prachi Patel-Predd, “Technology Review,” Michigan Institute of Technology, technologyreview.com, website, Thursday, April 05, 2007.